In a previous blog post, I mentioned that I took a road trip to New York and went to two book sales. The first one was in Greenwich, Connecticut and the second was in Poughkeepsie, NY. 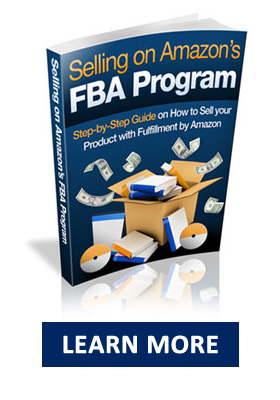 For the New York sale, I decided to prepare an FBA shipment while camping in a tent. After the book sale, I headed to the Sylvan Lake Beach Park in upstate New York. 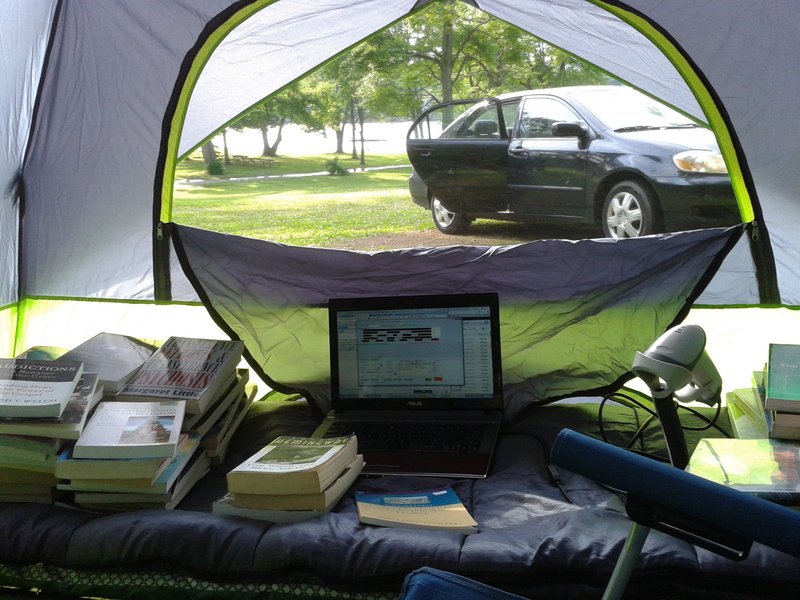 I listed all the books in the tent using a barcode scanner and Excel on my laptop. After I listed the books, I put them into boxes. No power or internet connection required for this. I just had to make sure my laptop was fully charged. This took around 3 hours. 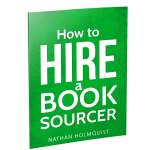 The next day, I went to Starbucks with my laptop and uploaded the ISBN numbers into Amazon’s Bulk Inventory Loader and used the FBA Labeling Service so I didn’t have to go back and label the books. Once the items were uploaded, I converted them to FBA and printed the shipping labels and packing slips on a small printer. I felt a bit awkward using a printer at Starbucks, but no one seemed to notice or care. Finally, I went back to the car and put the packing slips in the boxes, taped the boxes, and put the shipping labels on the boxes. Then headed to the UPS store. 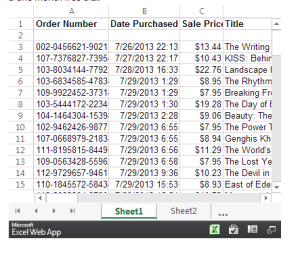 If you would like to view the individual statistics of each book sold please click on the spreadsheet below. This is wonderful Nathan, you are a good teacher. Thank you for sharing! More, please when you can. Hi Kim, Thank you the compliment! Yes, I will be getting many more blog posts out in the future. 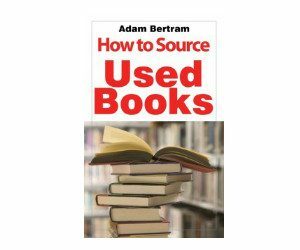 When listing on Excel, how did you price the books without being on-line? Or did you reprice after the upload? I am just curious how you handled that aspect. I have a repricing program that automatically reprices once the items get to the warehouse. So, I just put $100 default price for all the books, and the prices change later. Thanks for sharing this. This actually sounds like a lot of fun and would be a bit of a challenge at the same time. Whenever someone claims to be the “outdoors” type, they usually have never actually camped outdoors or anything close to it. They usually mean they play golf once a month. Keep rockin’! Yes, I’ve found that camping is a lot more fun when I’m doing something productive at the same time (i.e. making money). I was at the preview day. What day did you go? 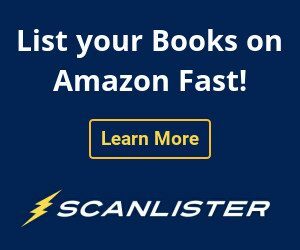 Listing while camping–I’m impressed. I assume you had a portable scale to weigh the boxes before you went to Starbucks to print the labels. I just estimated the weight of the boxes as I didn’t have a scale with me. The UPS guy told me that the weight was off and that Amazon might charge me the difference. I haven’t seen any extra fees in my account though. 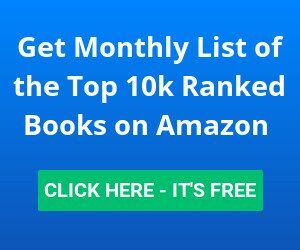 What was the average sales rank of the books you bought? The average rank was 784,000.